Bob Liebman, NSS 12718 RL FE, of 'BOB & BOB' Caving Supply has been diagnosed with cancer and needs financial help. Bob helped cavers for over 35 years meet their caving needs. His motto "Cavers Serving Cavers" took him to hundreds of caving events over the years, traveling with his white cat 'Froggie', and often times at greater cost than than his sales generated, but he went anyway to serve and meet and talk to his fellow cavers. He generously donated cave gear for contest and door prizes at hundreds of events over his career. He also generously supported cave expeditions and projects domestic and internationally with needed equipment. Now Bob needs your help and support! He was diagnosed with cancer in December, has begun chemotherapy treatments, spent three weeks in the hospital, and is now in a nursing rehab facility at this time to get stronger and continue chemo. His only insurance is Medicare which is limited in what they cover, and will not cover all costs being incurred. He is unable to recover at home an is in a full time rehab facilty. His medicare runs out March 22 at which time his facility charges will be almost 6K a month. We are now asking cavers to please help Bob in his time of desparate need financially with any donation you can give to help offset the expected onslaught of expensive medical and rehab facility bills. Any help will be greatly appreciated by him. is handling his affairs at this time. Bob is doing better. On Friday May 5th I was finally able to get Bob moved back into West Virginia. He has been in Virginia for three months in the hospital and then a nursing/rehab facility. I finally found space available and moved him back to WV. It will now be easier for friends to drop in and visit more often not having to drive to Virginia and back. He likes visitors and talking to people, always wants to talk... He is making progress, getting some noticeable strength back, but is still very weak. It will take time to get stronger. He is actively doing his physical therapy. He will have another PET scan to see where things are at, and another chemo treatment next week. He is very very grateful for all of your support and comments. He is sad the business had to close, but the time had come and he understands. You can of course send him a card at his or my address in the NSS members manual and I will get it to him. Again, on behalf of Bob and myself, THANK YOU for all your tremendous support and wonderful comments shared in his trying times. Spent two days with Bob, showed him all of your comments. He is thankful for your assistance and very humbled by the tremendous turnout and heartwarming comments from you folks. Thank You!. He is weak, and tires easily, typical for people fighting cancer. He is doing physical therapy trying strengthen his muscles to get walking again, which he would need to do to return home and leave the long term care facility. May it be an easy through trip, get well soon Bob. Prays for my old friend Bob. 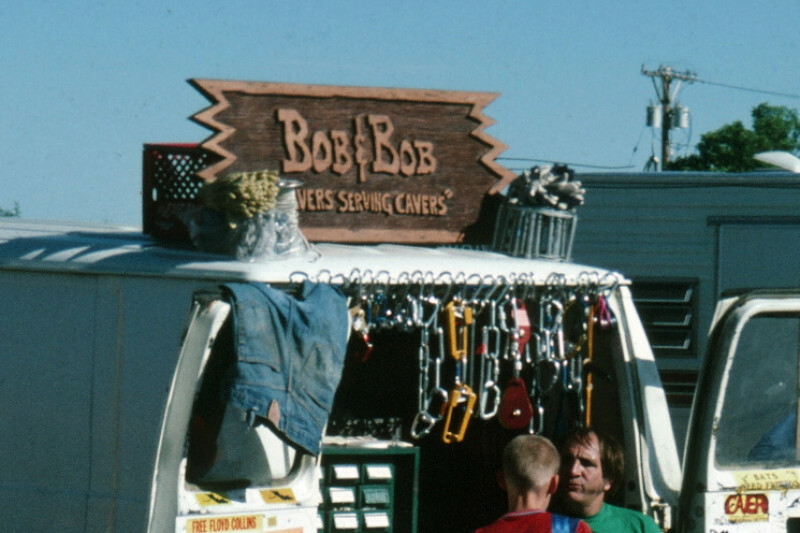 Bob, you sold me my first carbide lamp, and my first harness back in the 1970s. As a skinny teenager I asked you if it would support my weight and you reached down with one hand and lifted me up by my harness loop. Now it's my turn to lift you up in prayer to the Lord. God love ya'. In memory of my husband, Jack Middleton, and in honor of Emily Davis and Mike Warner, who were an enormous help to me after Jack's death. Bob, may you return to good health amidst the support of many caring cavers. Best wishes. You are a good friend, excellent host at your home and van, valued provider of caving equipment and all round good guy. Be strong and fight for quality of life. Hugs. Bob, you've been a great friend to the caving community. Thank You for all your service. Get well soon. ... Your friend, Gary.